On Saturday I went to the Chipping Norton Literary Festival with my fellow counter-terrorist operative (or rather, fellow mum) Clare. It was a gloriously sunny day as we drove, Thelma and Louise style but in a Peugot 307, through the Cotswolds. The first event we went to was ‘Coffee with Rachel Joyce’ which meant we got to eat some cake. The man behind the coffee bar told me that I was very messy and asked if I was married. Clare thinks that I could have pulled. We were near the back, so struggled to hear at first, but were soon engrossed in the interview. Rachel’s answers were honest, thoughtful and sometimes moving. She talked of her late father, and his boating shoes. She explained how she entered Harold Fry’s journey, covering the walls of her writing shed with maps torn from a road atlas, which then left her husband stranded somewhere outside Bath. She talked about writing plays for radio, and about the fact that she thought of Harold and Maureen as Anton Rogers and Anna Massey originally. 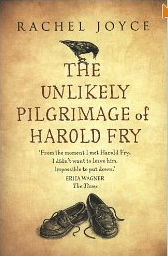 I would love to hear the original radio play ‘To Be A Pilgrim’ from which the book grew. Rachel Joyce spoke of how writing plays for radio was fairly anonymous, when asked how it felt to be thrust into the spotlight. She said she had to write the novel, but she has to balance the attention this has got her with family life. So whenever possible, they will all go somewhere together – for example when the book launched in Canada the whole family made a holiday out of it. Clare and I thoroughly enjoyed hearing the talk, and got our books signed by Rachel Joyce afterwards, feeling quite starstruck. I am looking forward to Joyce’s next book (she read and extract and it sounds excellent, and intriguing – as it plays with time), and hope she writes many more as she is an excellent writer, who can catch you out with her brilliant turns of phrase.